Many Catholics are confused about suffering. Some writers extol its surpassing value. But does that mean that we should look for suffering? Or, if suffering should come our way, that it would be unspiritual to seek relief from it? The story of Jesus and the leper in Mark 1:40-45 provides us with a case study on the subject. In biblical times, “leprosy” encompassed many different skin diseases. We don’t know what kind of leprosy the man had, exactly. It could have been Hansen’s disease, which is what we call leprosy today. In that case, he would not have been in a lot of physical pain, since this disease takes away one’s ability to feel much of anything in many parts of the body. This, in fact is one of the problems with the disease. Pain actually is actually designed to be a gift from God–it tells us that there is something wrong so we can attend to the problem before it gets worse. Without this unpleasant sensation we might be tempted, for example, to ignore an infection or continue to put stress on an overworked muscle that desperately needs a rest. The consequence can be permanent damage to the organ in question, and this is why lepers are often horribly disfigured, with missing digits and extremities. This hideous appearance causes the leper further suffering. 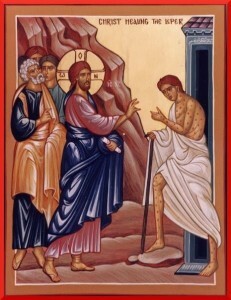 So the leper asked Jesus to rid him of his despicable disease, with all it ugly consequences. Jesus promptly healed him. He did this not to prove he was a prophet, the messiah, indeed, the Son of God. In fact, he gave the man strict orders not to broadcast the news of the miracle. Jesus healed him, instead, out of compassion. It was a work of mercy, which is love’s response to suffering. Notice Jesus did not scold him for wanting to be relieved of the suffering associated with this dreadful disease. He had the power to free him from it and so he did. So there are at least two lessons here–it’s OK to seek relief from suffering and, should we encounter it in others, we must do all we can to relieve it. But there is more. Jesus took away one source of suffering but imposed another. The former leper was understandably thrilled at his change of fortune and passionately wanted to tell everyone about it. Jesus commanded him to restrain his passion and be quiet. This by the way, was for the good of others–to make it possible for Jesus to move freely through the towns of Galilee preaching the gospel and revealing his identity in his own way and according to his own timetable. But the leper would not accept the discipline imposed upon him by the Son of God, and the result was that from that point on, it was Jesus, instead of the leper, who had to stay out in the wilderness, away from the towns. We need not go looking for suffering. It will inevitably find us. Generally, we should seek relief from many forms of suffering, such as physical illness. But as long as we find suffering to be our traveling companion, we should bear it with as much joy and faith as possible in the name of the Lord, who suffered for us, joining our suffering to His for the redemption of the world. This is what St. Paul says – whatever we do, and whatever we have to endure, we must do for the glory of God and the salvation of all (I Corinthians 10:31-33).